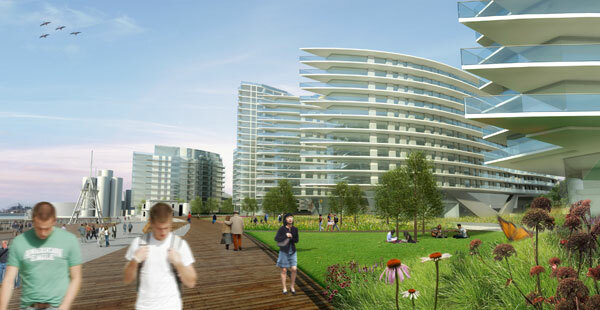 Concept design for a mixed-use development on the Thames. 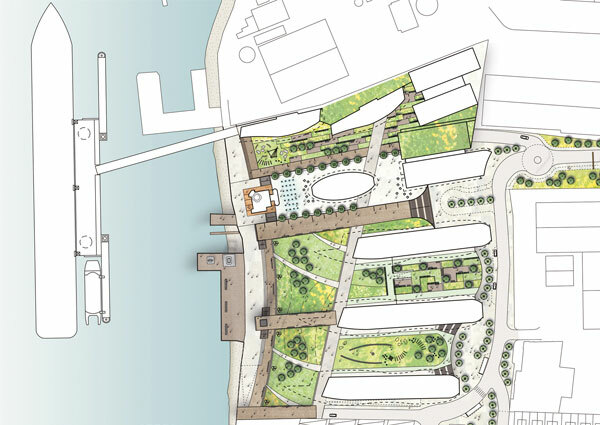 This project presented a unique opportunity for the creation of a large scale open park with wide views across the Thames. Timber boardwalks reach outward towards the river echoing the direction of the historic rope and cable laid out in the 18th and 19th centuries. Green spaces vary from wild to cultivated incorporating tidal reed bed terraces, wildflower meadow, and herbaceous grasses and perennials recreating the swathes of the original Thames marshland. From the central park area, private gardens and play areas are defined through the transition from public to private space. High quality public realm incorporates elements such as fountains, artworks, lighting and seating. The visual language for the park is constructed from a restricted palette of materials including Portland stone, granite, resin bound gravel, timber and corten steel. Carolyn Willitts was the project landscape architect; she assisted in the development of the masterplan and was responsible for the landscape design and landscape graphics. She also worked closely with the Environment Agency and marine engineers in the design of the Thames tidal terraces. 3d visualisations created by Andy Gough.